DiSH lab blog » Blog Archive » DiSH Lab at Cerritos College Psychology Day! DiSH Lab at Cerritos College Psychology Day! 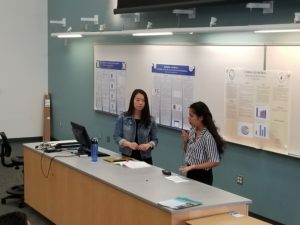 One of our awesome RAs, Nancy Gomez, presented a poster on an independent project she’s been working hard on for the past year with Dr. T. Nancy previously attended Cerritos College before transferring to UCLA, and she also participated in our first-ever NSF Summer Intensive program in 2016! As Nancy mentioned, Dr. T was also a keynote speaker at the conference. We’re so happy that many of the students were excited by the research we do here, and we hope to see some of them in our summer intensive program this year!